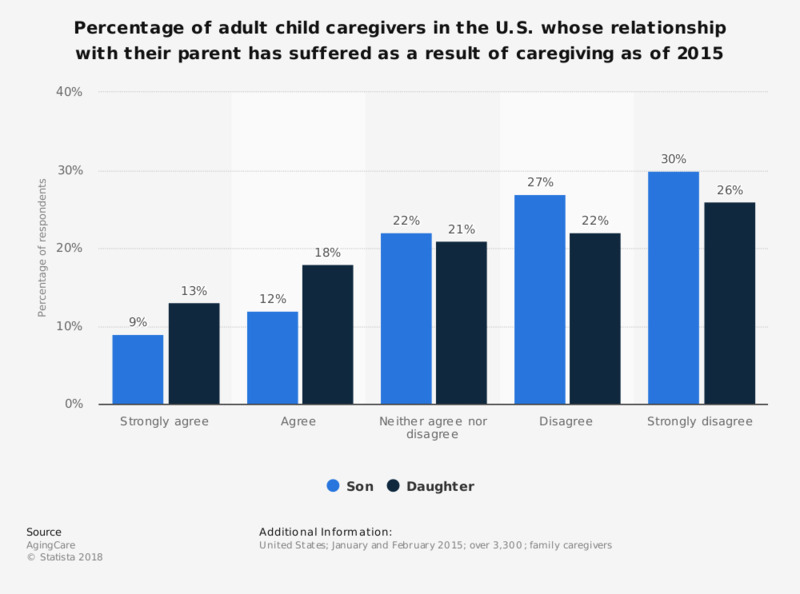 This statistic presents the percentage of adult child caregivers in the U.S. whose relationship with their parent has suffered as a result of their having to act as caregiver to the parent as of 2015. It was found that 31 percent of daughters who acted as caregivers to a parent agreed their relationship with their parent has suffered as a result of this caregiving role. Original statement: "My relationship with my parents has suffered as a result of my caregiving." According to you and your experience, what are nowadays the biggest problems in the relations between parents and children? Have you ever got drunk together with your parents? How has the child/parent relationship changed compared to past generations? When making purchasing decisions, which product categories do kids make decisions or decide with their parents about? Has family decision-making become less hierarchical and more collaborative in general?